I am in Virginia, where there are naturally a lot more trees than in Wisconsin. And it’s a bit warmer, though not by much this week. The different environment means different birds for me! I saw this hawk shortly before sunset. Even though it looks little like a redtail, it is much smaller. I looked it up after getting back inside, and according to All About Birds, it’s either a red-shouldered hawk or an immature broad-shouldered hawk. From the reddish tinge, I want to say for sure it’s a red-shouldered hawk, but I’m too new to these species to wager a real guess. I’ve seen these birds in Midwestern guidebooks, so if I look around Wisconsin enough, I should eventually find them. But they aren’t common in my backyard, so this was an exciting find. 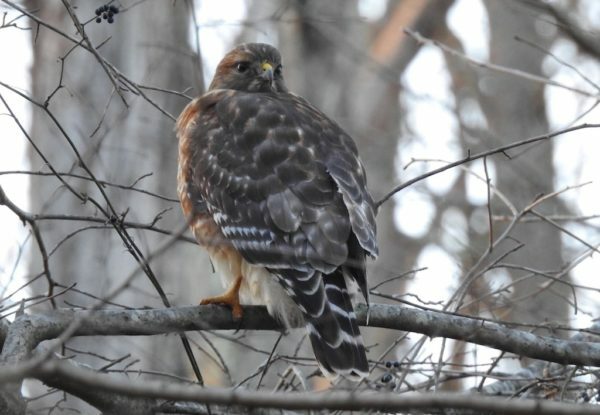 Update: I found out that broad-shouldered hawks don’t winter in Northern Virginia, so it must by a red-shouldered hawk.